Hip Hop’s golden era constituent, Queens’ native, the godfather of Mafioso rap, legendary and influential emcee, Kool G Rap will release his new solo album, Return Of The Don, which is entirely produced by MoSS on June 2nd. 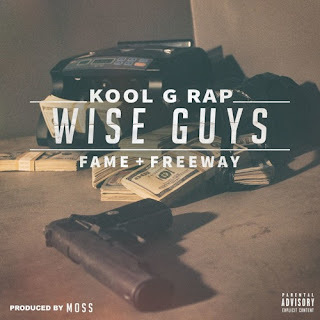 Here they release the first single, “Wise Guys” featuring Freeway and Fame (M.O.P.) with cuts from Statik Selektah. “What motivates me to get in the studio is really being in that creative zone that you cannot just enter on demand” G Rap stated. “It is more like an extremely powerful vibe that overcomes you. It’s triggered by hearing a particular track, or being inspired by another artist; or, a life experience that makes your mind and heart open up and lyrics just pour from your soul in the capacity of an avalanche. That’s what The Return Of The Don represents; an amalgamation of past, present and future and a tribute to some of my most favorite spitters worldwide; this is my salute to those artists."